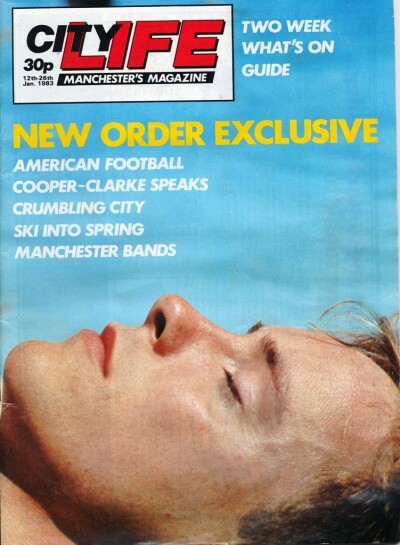 A batch of City Life magazines; this one Jan ’83 with a New Order cover. Not sure, but that photo looks surprisingly like photos in the N.M.E. I think, of their Australian tour round a similar time. Wonder what’s inside...? There’s a story on the Wythenshawe Labour Party being in chaos. Many’s the time I’d walk past Alf Morris’s office in Hollyhedge on me way to the chippy (miss those Holland’s Pies! ), and that rather portly gentleman could oft be seen stood outside having a break and taking the air. Although it’s hard not to be cynical about politicians and their true motives and agendas, (probably more so these days with an exhaustive amount of time and effort put into sound bites and spin), I always got the impression that Alf was of the community, well intentioned and basically a good egg. Ultimately beyond a healthy level, cynicism’s not an upful or positive thing, so on ya Mr. Morris for instilling some semblance of dignity and a template of of honourable accountability in your office from the young lad with the semi flares and a mush full of chips. Checked it; of course it's by that man again, Kevin Cummins.